Who Is Covered by Private Long-Term Care Insurance? Many Americans will develop health problems as they age and need assistance with everyday activities. Private long-term care insurance could protect them from high out-of-pocket costs if they need paid assistance at home or in nursing or assisted-living facilities. Yet, only 11 percent of adults ages 65 and older had coverage in 2014, including only 25 percent of those worth at least $1 million and who would benefit most from coverage. Various policy reforms could promote long-term care insurance, such as ones that create new incentives for employers to offer coverage through workplace retirement plans on an opt-out basis. Many Americans develop health problems as they age that make it difficult for them to complete everyday activities. In 2015, 5.8 million adults ages 65 and older living in the community (not in nursing homes) needed help with personal care or routine activities, accounting for 12 percent of that population. Slightly more than one-third of these older community-dwelling adults with disabilities—2.2 million people—needed help with two or more activities of daily living (ADLs), such as dressing, eating, or bathing.1 Another 1.2 million adults ages 65 and older live in nursing homes, the vast majority of whom have serious disabilities (Harris-Kojetin et al. 2016). Looking forward, projections from DYNASIM, the Urban Institute’s dynamic microsimulation model, suggest that about one-half of today’s 65-year-olds will eventually need help with two or more ADLs or develop severe cognitive impairment (Favreault and Dey 2015). Most older people with disabilities rely exclusively on help from unpaid family members and friends (Spillman et al. 2014). When they need more assistance than these caregivers can provide, they often turn to paid long-term services and supports (LTSS), such as formal home care, residential care, and nursing home care. These services and supports are expensive. In 2015, the median cost of a year of nursing home care in a semi-private room was about $80,000, while the median cost of home care was $20 per hour (Genworth 2015). Traditional medical insurance does not cover these services, Medicare provides coverage only in special circumstances, and Medicaid covers only those people with severe LTSS needs who have virtually no assets other than their home or have already spent nearly all of their wealth on LTSS. Consequently, many people who develop serious disabilities in later life experience financial hardship (Johnson, forthcoming). Private long-term care insurance could provide financial protection to older adults who use paid LTSS. Nearly all policies sold today cover nursing home stays and home care, usually for a fixed period, such as three, four, or five years; lifetime coverage is rare (American Association for Long-Term Care Insurance 2015). Policies typically reimburse policyholders a specified amount for each day of home care or nursing home care received during the coverage period. The average reimbursement rate was about $150 per day in 2015, and three-quarters of plans sold today include at least some inflation protection (Cohen 2016). Annual premiums are generally fixed for the life of the policy and may rise only if insurers can demonstrate to state regulators that claims for a class of policyholders—defined by issue age and year—exceeded expectations. However, annual premiums rise with issue age, because people who first purchased coverage at older ages generally make fewer premium payments over their lifetime than those who purchased earlier. Giese and Schmitz (2015) estimated that the annual premium for a policy with a $180 daily benefit, inflation protection of 3 percent per year compounded, and a three-year benefit period would be $2,159 if first purchased at age 45 and $4,496 if purchased at age 65. Long-term care insurance was first offered in the early 1980s, and the market grew rapidly for two decades. Recently, however, the market has been contracting. Between 2002 and 2014, the number of policies sold in the individual market each year fell 83 percent, from 754,000 to 129,000 (Cohen 2016). Group market sales, offered through employers, have also fallen. This brief describes the share and characteristics of the older population covered by private long-term care insurance. The analysis used data from the Health and Retirement Study (HRS), a nationally representative household survey of older Americans conducted by the University of Michigan’s Survey Research Center.2 The survey began in 1992, but first included a consistent set of questions about long-term care insurance in 2002.3 We examined trends in coverage from 2002 to 2014 for adults ages 55 to 60 and ages 65 and older. We also compared coverage rates by household wealth, education, and race and ethnicity. The results indicate that relatively few older people have private long-term care insurance coverage, even among wealthy older adults who could gain the most from coverage. 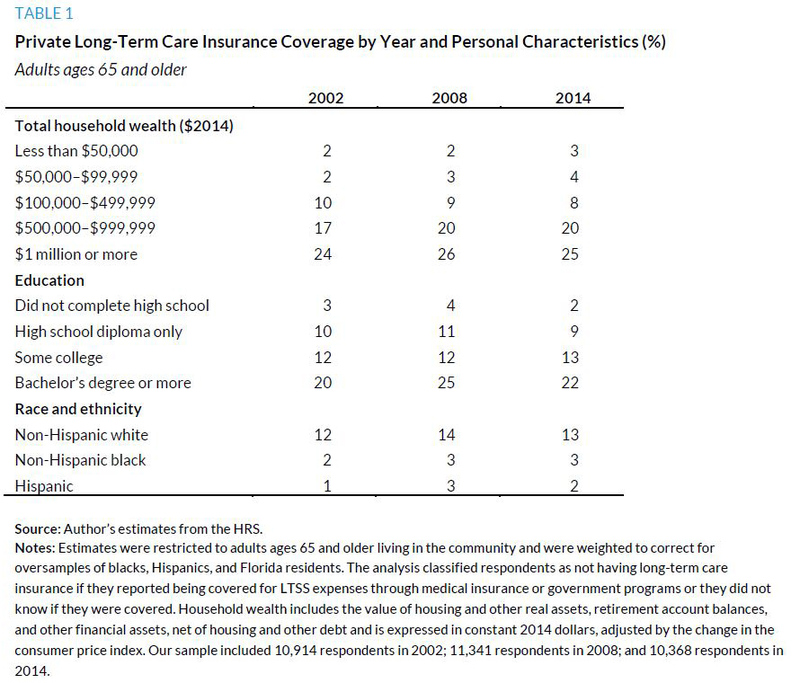 In 2014, 11 percent of adults ages 65 and older living in community settings were covered by long-term care insurance (figure 1), corresponding to about 5 million people.4 Coverage rates at ages 65 and older grew between 2002 and 2008, but fell after 2008, consistent with industry data on the total number of long-term care insurance policies in force during the period (Cohen 2016). Between 2008 and 2014, coverage rates fell more sharply at ages 55 to 60, when many people first purchase coverage, than at older ages. This decline likely reflects the drop in sales of long-term care insurance over the past decade. Private long-term care insurance coverage rises with wealth, because wealthier people are better able to afford coverage than those with less wealth. Moreover, people with limited wealth can more easily obtain Medicaid coverage to finance LTSS than wealthier people, who would have to incur substantial out-of-pocket expenses before they had depleted enough assets to qualify for Medicaid. In 2014, coverage rates reached 25 percent for adults ages 65 and older with at least $1 million in total household wealth and 20 percent for older adults with at least $500,000 but less than $1 million in household wealth (table 1). By contrast, only 8 percent of older adults with at least $100,000 but less than $500,000 in household wealth—representing 40 percent of the older population—had coverage. Median household wealth, which includes the value of housing and other real assets, retirement account balances, and other financial assets, net of housing and other debt, was $215,000 among adults ages 65 and older in 2014. Twelve percent of older adults had at least $1 million in household wealth in 2014. Coverage rates also increase with education and are significantly higher among non-Hispanic whites than people of color. Only 2 percent of older Hispanics and 3 percent of older non-Hispanic blacks were covered in 2014, compared with 13 percent of non-Hispanic whites. Several policy reforms could promote private long-term care insurance coverage. For example, the Bipartisan Policy Center (2016) recently recommended regulatory changes to allow standardized, low-cost, limited benefit polices that would be less complex and more affordable for consumers. The center also recommended creating new incentives for employers to offer private long-term care insurance coverage through workplace retirement plans on an opt-out basis, allowing adults ages 45 and older to use savings from Individual Retirement Accounts and employer-sponsored retirement accounts to purchase coverage without incurring early withdrawal penalties, and permitting state and federal health insurance marketplaces to sell long-term care insurance. The Long-Term Care Financing Collaborative (2016) incorporated many of these recommendations in its recent LTSS financing proposal, which would combine a new universal catastrophic insurance program with initiatives to revitalize the long-term care insurance market to help address non-catastrophic LTSS expenses. The collaborative also endorsed continued experimentation with hybrid products that combine long-term care insurance with other insurance, such as annuities, life insurance, or disability insurance. Private long-term care insurance is not the best way to finance LTSS for every older adult. People with limited financial resources and pre-existing health conditions, for example, may always have to rely on public programs like Medicaid. However, expanded long-term care insurance coverage could protect many middle- and upper-income older Americans from catastrophic LTSS expenses. American Association for Long-Term Care Insurance. 2015. “The 2015 Sourcebook for Long-Term Care Insurance Information.” Westlake Village, CA: American Association for Long-Term Care Insurance. Associated Press-NORC Center for Affairs Research. 2015. Long-Term Care in America: Americans’ Outlook and Planning for Future Care. Bipartisan Policy Center. 2016. Initial Recommendations to Improve the Financing of Long-Term Care. Washington, DC: Bipartisan Policy Center. Brown, Jeffrey R., Gopi Shah Goda, and Kathleen McGarry. 2012. “Long-Term Care Insurance Demand Limited by Beliefs about Needs, Concerns about Insurers, and Care Available from Family.” Health Affairs 31 (6): 1294–1302. Cohen, Marc A. 2016. “The State of the Long-Term Care Insurance Market.” In The State of Long-Term Care Insurance: The Market, Challenges, and Future Innovations, 2-29. Kansas City, MO: National Association of Insurance Commissioners. Favreault, Melissa, and Judith Dey. 2015. Long-Term Services and Supports for Older Americans: Risks and Financing. Washington, DC: US Department of Health and Human Services, Office of the Assistant Secretary for Planning and Evaluation. Genworth. 2015. Genworth 2015 Cost of Care Survey. Richmond, VA: Genworth Financial Inc.
Giese, Christopher J., and Allen J. Schmitz. 2015. “Premium Estimates for Policy Options to Finance Long-Term Services and Supports.” Brookfield, WI: Milliman. Harris-Kojetin, Lauren, Manisha Sengupta, Eunice Park-Lee, Roberto Valverde, Christine Caffrey, Vincent Rome, and Jessica Lendon. 2016. “Long-Term Care Providers and Services Users in the United States: Data from the National Study of Long-Term Care Provides, 2013-2014.” Vital and Health Statistics 3 (38): 1–105. Johnson, Richard W. Forthcoming. “Later-Life Household Wealth before and after Disability Onset.” Washington, DC: Urban Institute. Long-Term Care Financing Collaborative. 2016. A Consensus Framework for Long-Term Care Financing Reform. Spillman, Brenda C., Jennifer Wolff, Vicki A. Freedman, and Judith D. Kaspar. 2014. Informal Caregiving for Older Americans: An Analysis of the 2011 National Study of Caregiving. Washington, DC: Department of Health and Human Services, Office of the Assistant Secretary for Planning and Evaluation. Wiener, Joshua M., Galine Khatutsky, Nga Thach, Angela M. Greene, Benjamin Allaire, Derek Brown, Helen Lamont, William Marton, and Samuel Shipley. 2015. Findings from the Survey of Long-Term Care Awareness and Planning. Washington, DC: US Department of Health and Human Services, Office of the Assistant Secretary for Planning and Evaluation. Richard W. Johnson is an economist and senior fellow in the Urban Institute’s Income and Benefits Policy Center, where he directs the program on retirement policy. His research focuses on income and health security at older ages. He is an expert on older Americans’ employment and retirement decisions, and recently directed a team of researchers who graded public employee pensions in all 50 states and the District of Columbia. His long-term care research focuses on the affordability of long-term services and supports and the financial consequences of disability onset in later life. Johnson received an AB from Princeton University and a PhD from the University of Pennsylvania, both in economics.